This entry was posted in Sharing and tagged Census 2010. View the CCC brochure from the Census Bureau, or download the Publisher file (8.5 MB) so you can customize the brochure for your own CCC activities. This entry was posted in Sharing and tagged Census 2010, Complete count committees. In January, the Steering Committee sent the attached letter and partnership form to the director of the Census Bureau on behalf of the State Data Center program. 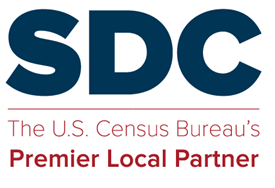 The letter reaffirms the program’s partnership with Census Bureau and offers SDC support to efforts to promote the upcoming census by becoming a 2010 Census Partner. The partnership form lists the various ways in which SDC members might be involved in promotional activities but also clearly acknowledges that not all members can do all (or any) of the activities listed. The partnership form covers the SDC program as a whole and as a national partner. SDC members can still sign their own individual partnership agreements and participate in state or local partnership activities. As in the past, there are many ways that SDCs get involved and we encourage you to do whatever you can to promote a successful 2010 Census. This entry was posted in Steering Committee and tagged Census 2010.